WARNING! Google Maps uses a very DANGEROUS route through the Wilderness. Please use the Driving Directions shown below. From Interstate 5 at Redding, take Highway 299 to downtown Weaverville. Take Highway 3 out of Weaverville to north end of Trinity Lake, 5 1/2 miles past Trinity Center. Turn right on East Side Road over bridge and continue 8 miles. Turn left on East Fork Road and continue 2 miles to Alpen Cellars. From Interstate 5 at Yreka, take Highway 3 over Scott Mountain 2 1/2 miles past Coffee Creek. Turn left on East Side Road over bridge and continue 8 miles. Turn left on East Fork Road and continue 2 miles to Alpen Cellars. From Highway 101 at Eureka, take Highway 299 to downtown Weaverville. Take Highway 3 out of Weaverville to north end of Trinity Lake, 5 1/2 miles past Trinity Center. Turn right on East Side Road over bridge and continue 8 miles. 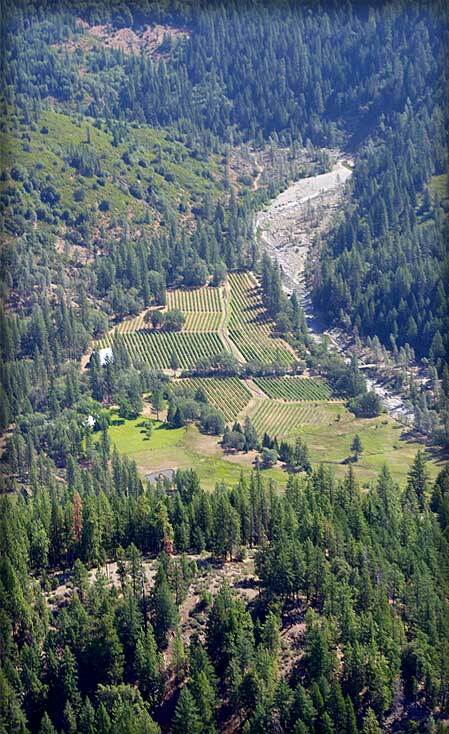 Turn left on East Fork Road and continue 2 miles to Alpen Cellars.